I love finding new ways to use deco mesh in addition to making fabulous wreaths with mesh. I came up with this idea about 2 months ago but I am just now finding the time to get pictures taken and instructions typed. 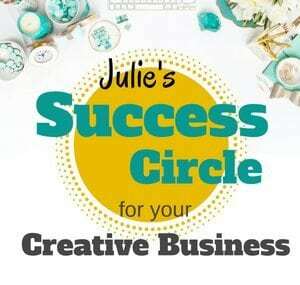 Here are the instructions for creating an adorable Easter egg decoration using a round wreath form. Please feel free to share and to change it up to make it your own. Read instructions all the way through once first before attempting. 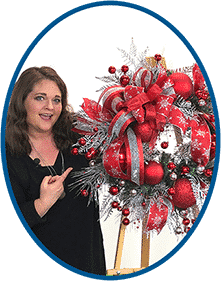 Bend the wreath form into the shape of an egg by placing the wreath vertically on top of a table and then using your hands, gently press down on the sides of the wreath form until it bends into an oval shape. Then move your hands up towards one end of the oval and gently press down more; this forms the more narrow end of the egg. Typically, the wreath form bends fairly easily without problem; however, this time (the time I need to take pictures) one of the frame’s crossbars popped off but I decided I would include this in my instructions in order to show you how to fix this in case it happens to you as well (I will show you how to fix later in the post). 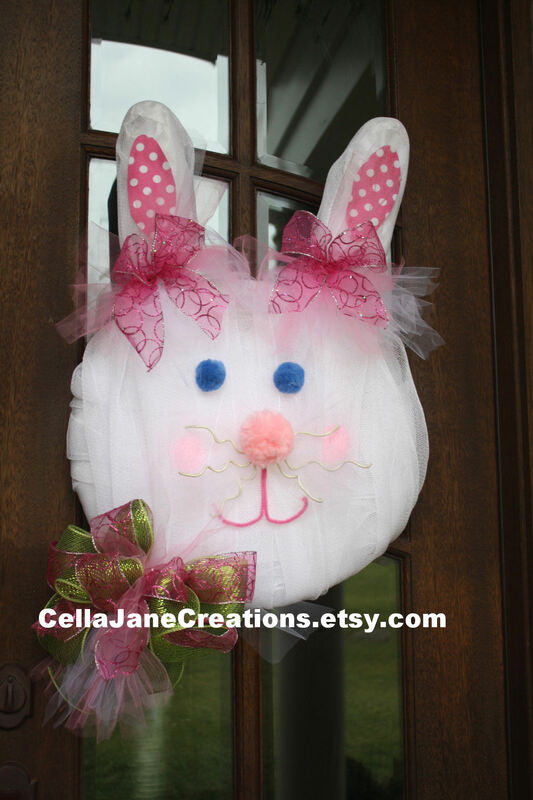 Once all the needle ties are wrapped around the wreath frame, the wreath is already looking like an egg. In fact, this is cute just as it is! Can’t you just imagine hanging these at different heights to use as decorations, you could even use a 24 & 30-inch wreath forms for various sizes? Before we move to the next step, let’s go ahead and hot glue the vertical support bar that popped off back into place. All we need to do is hot glue it back into place and let the glue harden completely. Measure 3 pieces of deco mesh that are long enough to wrap around the front and sides of the egg shape. I used the egg frame as a guide before cutting the mesh which measured to approximately 25 inches long. Remember the wreath form used in this example is 20 inches; if using a 24 or 30-inch wreath form you will need to increase the length of your mesh pieces as well as overlap the layers to increase the mesh width. Stack the 3 newly cut sheets of mesh on top of each other and lay the egg frame upside down on top of the stacked mesh pieces. Use the egg frame as a guide for trimming the corners off the layers of mesh. Make sure not too trim to much as you want the mesh to be able to wrap up the sides of the wreath form and over the outer frame. After trimming the corners off, your project should look similar to this. You may need to use a spool of ribbon as a weight to help hold the mesh flat while trimming. Sew all the way around the wreath form making sure to pull the mesh taught but not too tight so that it doesn’t stretch out of shape. As you can see below, the needle goes under the outer wreath frame, through the mesh and back up around the wreath frame again. Once I sewed all the way around the wreath frame, I sewed the entire wreath frame a second time for security. As you can see, once completed with the sewing there is excess deco mesh gathered on the back. Trim the excess deco mesh using the inner wreath frame as a guide. Now the fun begins! For the ribbon, I decided that I would ruffle the ribbon somewhat. To do this I first laid out my ribbon pattern with my ribbon to see how long the ribbon would be and then I doubled this length. Take the ribbon off of the egg and fold the end of the ribbon over like so. This seals the end of the ribbon to keep it from sliding off of the wires. On the other end of the ribbon, begin sliding the wire out of the ribbon. Move the fabric of the ribbon towards the end you just folded. The fabric of the ribbon will begin to ruffle and gather. Once you have the desired ruffle, trim the excess wires off and fold the end of the ribbon so that the fabric doesn’t slide back off. This is the amount of excess wire I ended up cutting off of the ribbon to give you an idea of how much I ruffled mine. Once you cut the wires off, fold the end of the ribbon to hold it in place. 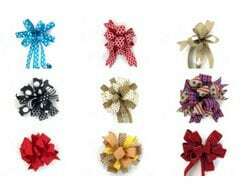 Reposition the ribbon back onto the wreath in the same pattern as before. Apply hot glue onto the mesh under both ends of the ribbon making sure to hold in place until cooled. Trim excess ribbon off. Then hot glue under the ribbon on the angles of the zigzag pattern and hold until cooled. This is all the glue you need for the ribbon. If you apply hot glue under the parts of the ribbon where the ribbon isn’t folded, the hot glue will show through the front of the ribbon. I added two additional strips of ribbon in another pattern by hot gluing the ends of the ribbon to the back of the egg. I chose these flowers because the colors match and they are flat. I put a small dot of hot glue under each flower and applied randomly. Here is another design using the same materials. My daughter likes poofy, so I made a poofy version for her door. 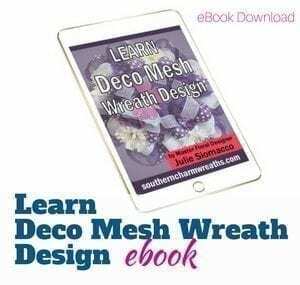 You can learn to make deco mesh wreaths too! 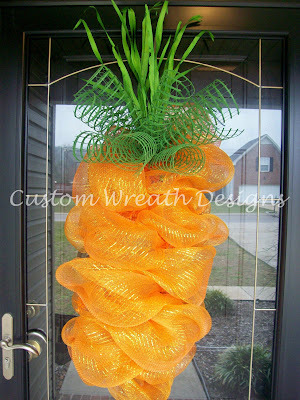 Learn how to make a deco mesh wreath using my ebook, www.learndecomeshwreaths.com. What other creative ways have you seen deco mesh used? Precious snowman by Mona Sutton (she said she received instructions to make this from Dee’s Crafts but changed a few things to make it her own). Very Cute!